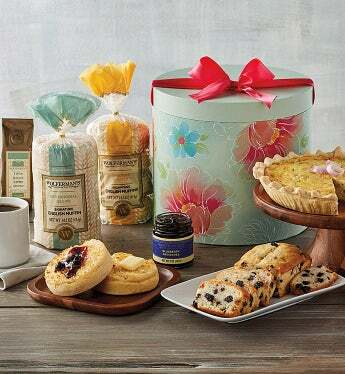 This year, send your love and gratitude to Mom with a delicious gift filled with sweet and savory bakery creations. We start with a delightfully sweet lemon vanilla blueberry loaf cake and a full-sized triple cheese and caramelized onion quiche from our bakery, two varieties of thick signature English muffins, and tangy blueberry preserves. To complete this tasty Mother's Day brunch, we've included robust Tiffin coffee.